As a first-time visitor to Aruba I must admit that the island exceeded my expectations. Of course I was excited to ditch my fall gear for shorts and tank tops and made sure my sunblock was the first thing I tossed in my over-packed suitcase. But Aruba is much more than a country glimmering in the Caribbean sun’s rays. It has a diverse landscape that is full of adventure; whether through the palate with culinary delicacies or exploring its diverse landscape. Yes, lying out on the beach is tempting, especially as miles of pristine sand sits dazzlingly at your feet, but there is much more to island than what meets the eye because its landscape is just as diverse as the many languages rhythmically blowing in the wind. And thanks to IGH’s fun-filled itinerary, I was able to see Aruba in an exhilarating light. The Caribbean is famous for its exquisite gourmet tastes, and the same can be said about Aruba. While staying at the Holiday Inn Resort Aruba-Beach Resort & Casino, I was treated to many delicacies, including a deliciously prepared meal by the resort’s Sea Breeze Restaurant & Bar’s Executive Chef, Imre Maraczi. Taking us on a culinary journey of some of Aruba’s staple dishes, each serving seemed to better than the last as the entire table drooled over every delectable presentation. 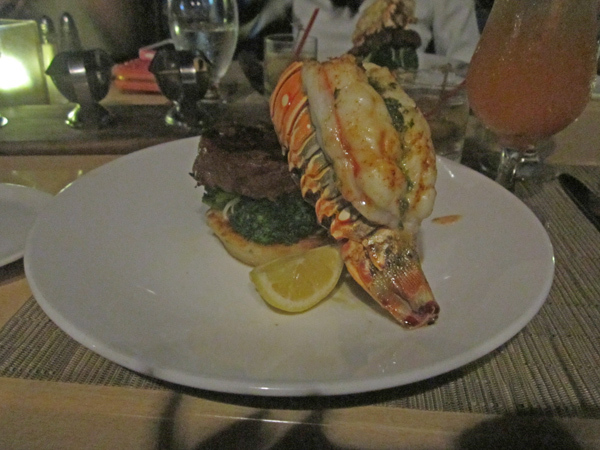 From lobster to steak and coconut crème brulee, we were left salivating for more as our palates became appeased by the Aruban flavor. Restaurants like Sea Salt Grill located in Oranjestad are filled with the aromas of local dishes like whole red snapper served with Aruban creole sauce, keshi-yena which is a combination of cheese and bread as well as fried funchi (polenta) with cheese. Paired with a glass of Chill, an authentic Aruban beer, I found it was one of the best ways to dine like a true native. Like I’ve said before, Aruba has plenty of thrills up its sleeves that exist far away from the beach. In actuality, you may want to hit the old dusty road to feel the cool Caribbean breezes brush against your face while tackling the rocky carpet of the island’s remote terrain. Off-road safaris are provided by companies like De Palm Tours. 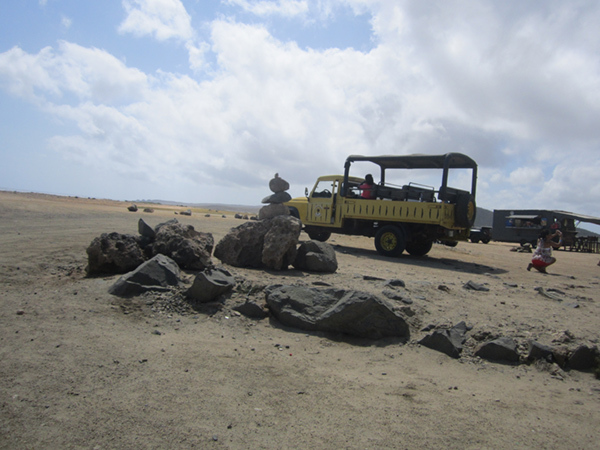 Here, an experienced driver will take you on a bumpy ride along Aruba’s wild landscape, passing colossal cacti, historic monuments and natural attractions until you are face-to-face with a natural pool surrounded by jagged rocks. It’s man against nature on this wild adventure, but if you think you can brave Aruba’s great outdoors then the off-road experience promises to be a wild ride you will never forget. Well maybe you shouldn’t drift too far from the ocean. After all, it boasts a sparkling turquoise color that is too stunning to ignore. 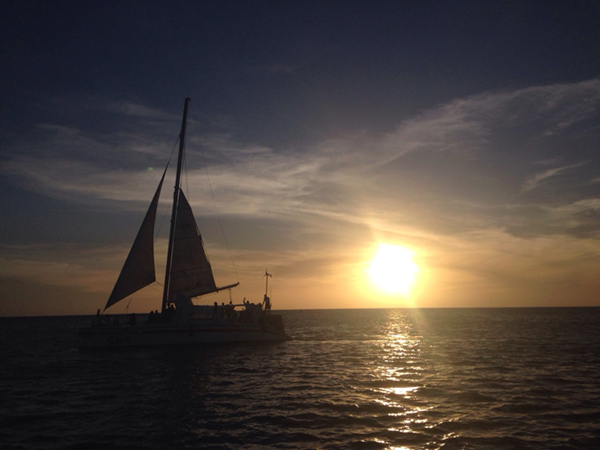 But instead of spending a day of swimming or snorkeling, hop on board of a catamaran and experience the beauty of Caribbean as it reflects the orange and yellow tints of the sunset. 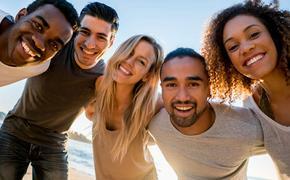 This top-notch experience is designed by different companies including Pelican Tours and De Palm Tours. With a signature Aruban cocktail in hand, tasty treats and music, every traveler should experience this romantic side of the country while the sun majestically fades behind the ocean. If you don’t believe me, then take a look at the picture below of this catamaran passing our boat in the night. Looking for action? 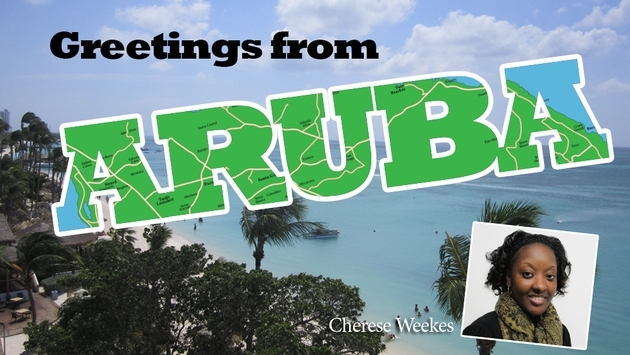 Then take a trip to Aruba’s vibrant downtown area. Colorful buildings aligned along its paved roads are constantly buzzing with activity. That’s because this quaint area is jam-packed with high-end international stores and local venders, great restaurants and museums. There are even trolleys that provide a peaceful free ride throughout the bustling area even if you just want to sit and capture the essence of Aruba. 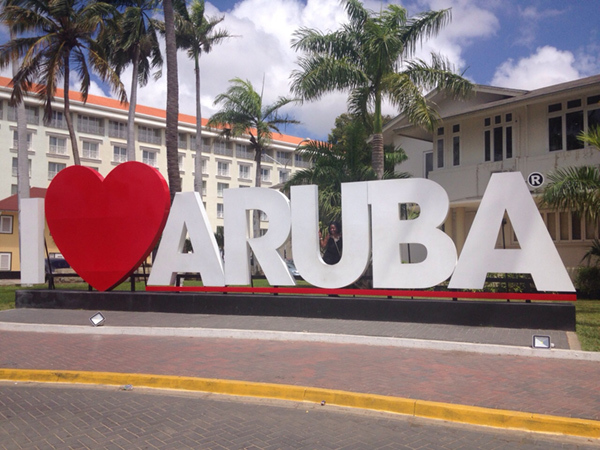 And if you’re looking for the perfect photo op, head to the I love Aruba sign and flaunt your cheesiest pose like me. Aruba’s historic attractions usually come with an interesting story. But it is numerous rock wishes that compel visitors and locals alike to want to join in on the age-old tradition. 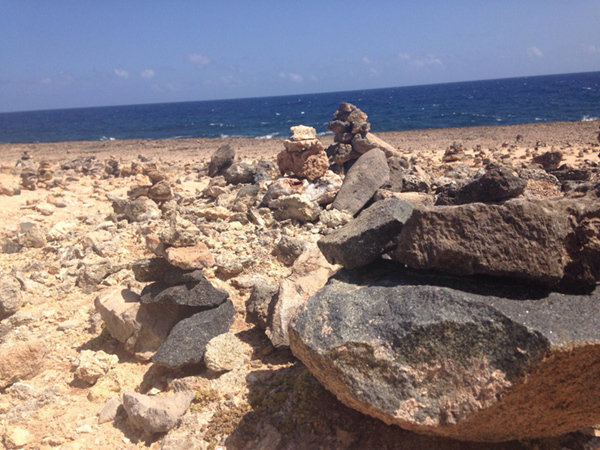 It is believed that if you stack seven rocks on each other, your ultimate desires will come true. And based on the multitude of rock wishes comprising Aruba’s hot desert, this ritual holds great value. Ever dreamed about becoming an instant millionaire? Then you may want to head to the rocky, red terrain of the island for a piling stone competition to see whose wishes will transform into a reality.